Batger is one of Australia’s largest privately owned educational and commercial furniture manufacturer and supplier. Established in 1953, we are proudly Australian owned. Our furniture is ideal for any situation that requires space-conscious design and style. We manufacture from our two factories in Sydney and import regularly. We believe that Australian-made quality and world-class standards should be affordable and our competitive prices reflect a commitment to making furniture of this standard available to every modern institution. Batger has over 4000 customers across Australia, South East Asia and the Pacific. We have high client retention due to the high quality of our product, our extensive knowledge base and ongoing customer service. 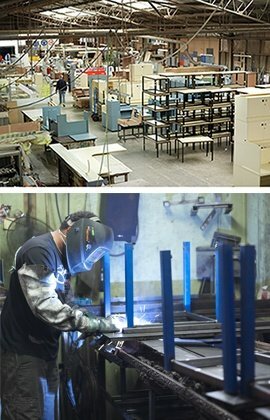 Batger supplies furniture to hundreds of projects through out any given year, all varying in complexity, cost and size. Below is a small handful illustrating our diversirty and capacities. Over 400 schools around Australia were transformed by R.E. Batger during the BER. R.E. Batger were engaged in private partnerships for the Victorian, ACT and New South Wales Governments. Over 200,000 pieces of furniture supplied. Supply of furniture for the national roll-out of American Express Currency Exchange branches - inside Australia Post and Westpac branches. Supply of furniture for fit out of immigration processing centre in Western Australia. Office fit outs for demountable construction site offices. Batger has a strong commitment to the environment and creating a sustainable future for generations to come. We have worked hard to achieve our environmental and quality control certification (AS/NZS ISO 14001:2004 and AS/NZS ISO 9001:2008) from NCS International. These two certifications signify the company’s vision to seek out and constantly improve manufacturing to ensure environmental stainability and harm minimisation.